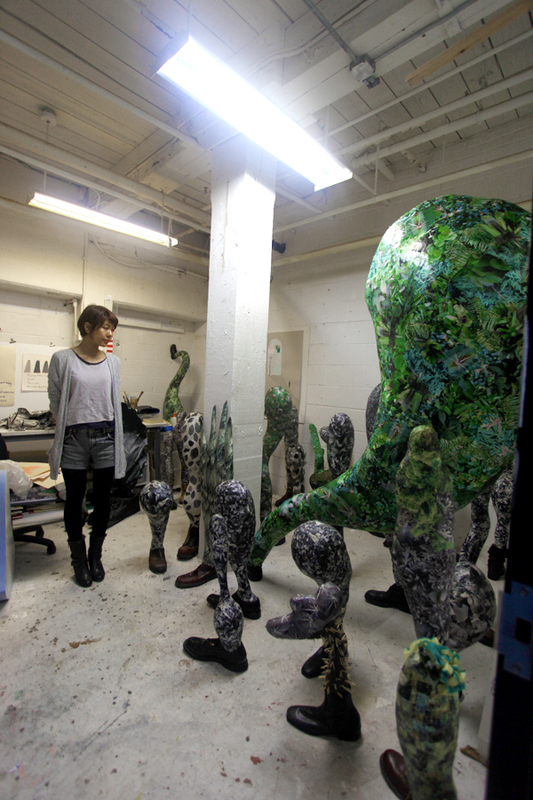 Maiko Kikuchi is an installation artist from Pratt’s MFA program. Originally from Japan, Maiko speaks with us about her inspiration from her ‘weird’ dreams, her thesis installation and how her background in fashion design and illustration influences her work and her process. F: Can you talk about your background and where you came from before Pratt? MK: I went to Musashino Art University in Tokyo, Japan as my undergraduate. 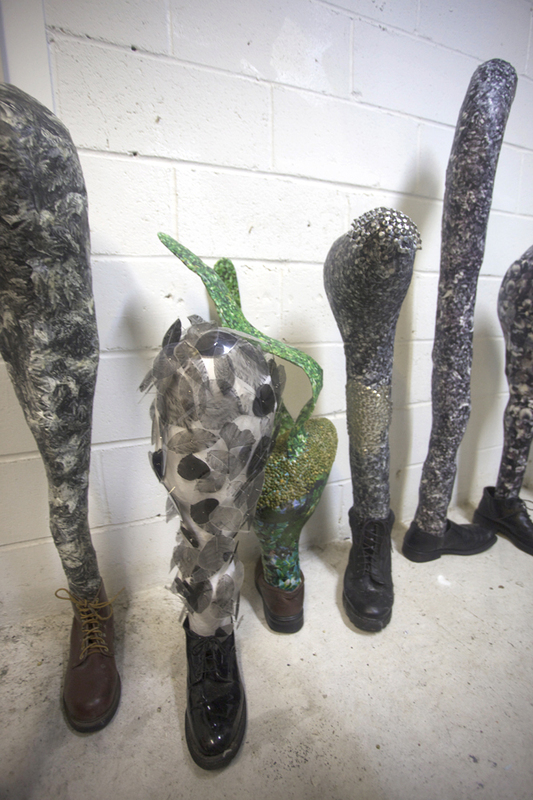 Though my major was fashion design, I was interested in clothes as a sculpture which would be able to wear. After graduation, I was working on llustrations for some books or packages but I became to want to make art not only for customers but for myself then decided to focus on ﬁne art. I love my country, Japan but I thought I’d be able to broad my expression in NY where has many diﬀerent kind of people or cultures. That’s a reason why I chose to study at Pratt. F: Tell me about your work and what your installation was like in your thesis show. MK: I keep thinking how I express a boundary between reality and dream whenever I make my works. I often had a same dream when I was little and it made me confuse that whether this dream was reality or not. That weird feelings became a core of my works. I can express it through my drawing or collage but I want to involve viewers in my strange dream by oﬀering actual space as an installation composed of my sculptures. 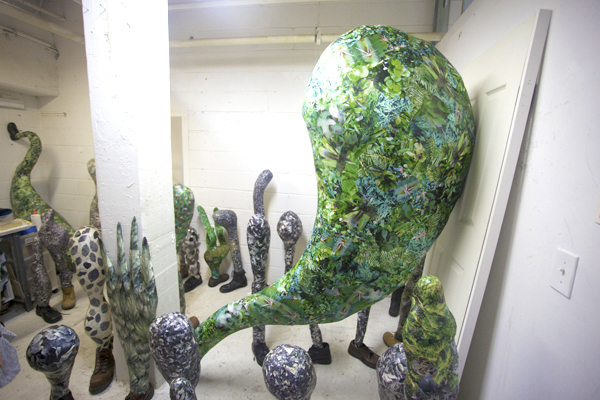 F: We’re seeing these sculptures close together in a tight space [in your studio]. Was it also like that in the installation or were they more spread out? sculptures. That was important for making them feel as if they were a part of my dream. 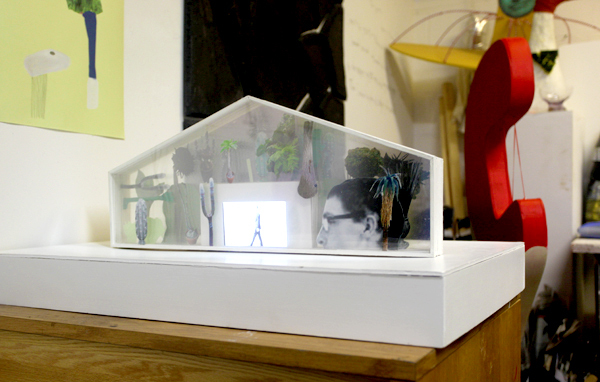 F: Is the video in the miniature greenhouse, the same video projected in your installation? MK: The ﬁlm I projected on the wall in my thesis show was diﬀerent from the one played in the small green house. In the small greenhouse, businessman is just walking about and the one for the gallery’s wall shows the life size businessman who came out from the small green house is working toward the actual door installed on the gallery’s wall, and knocks it. 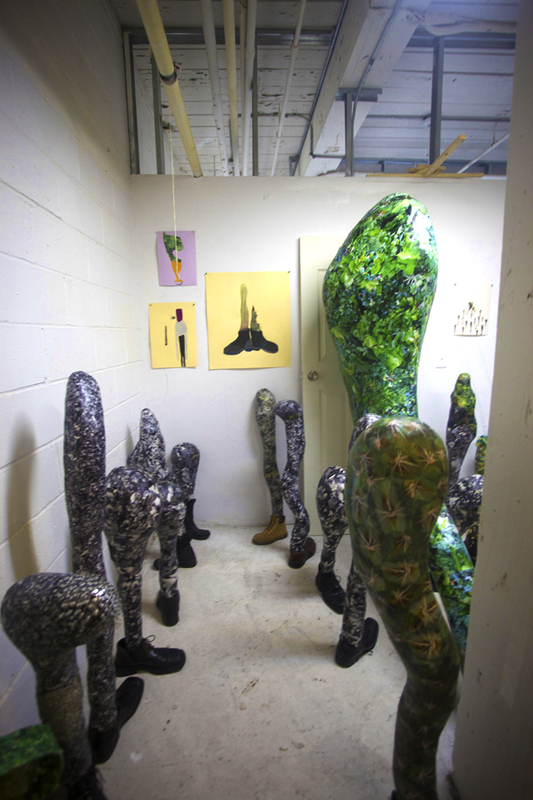 Because a huge green sculpture in a shoe lean against the opposite side of the door never responses to him, the businessman turns back to the small green house. In this way, I tried to show that kind of short story which is repeated in the dream by using two diﬀerent ﬁlms. My show’s title, “My Neighbor Always Pretends Not to Be Home.”, is from that story. F: Why did you choose a businessman? What significance does the businessman have in your work? MK: A businessman is a metaphor of reality to me. They wear similar suits, similar hair and behave in a similar way almost everyday. They seem to be a stranger but you may be the one of them. I believe that’s what a businessman is. F: Can you talk about your drawings and how they relate to your sculptures? 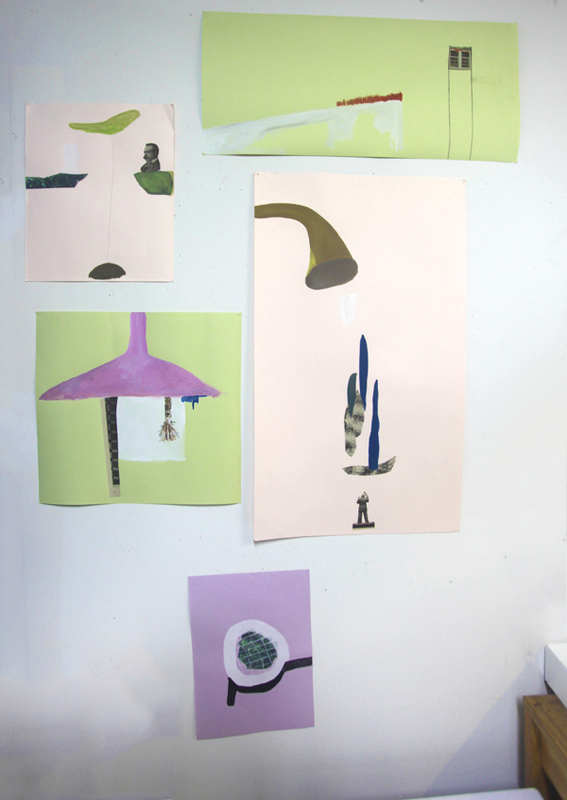 MK: Drawing and collage is my ﬁrst step for making visible form from ambiguous image in my mind. 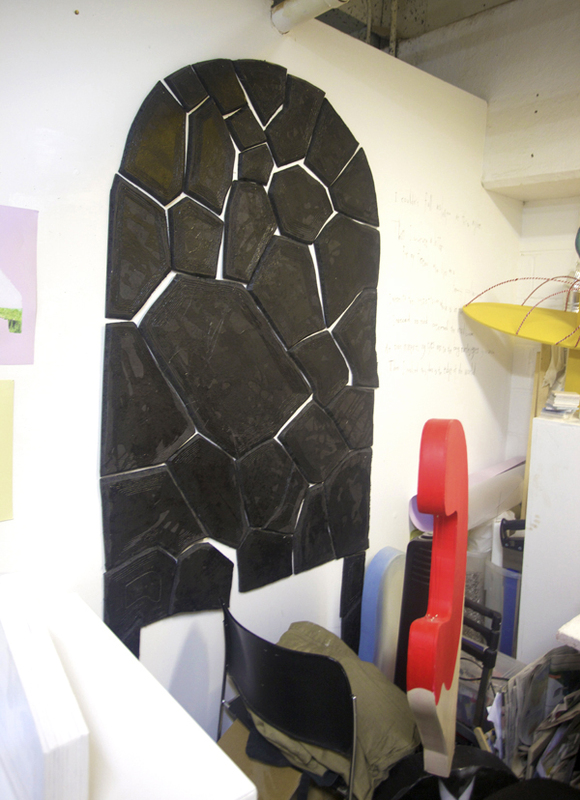 It could be ﬁnished work but also idea sketch before making sculpture. Relation between two dimensions and three dimensions is important for my consistent theme “construct a strange dream”. Because dream is a existence whose dimension is undeﬁned. Sometimes the thing seems to be two dimension is actually something three dimension, at other times the thing looks solid is really ﬂat. Showing such a distortion of dimensions is one of the expresion of dream. I have been looking for my own way to convert two dimensional collage to three dimensional collage. F: Can you talk about the process you went through to create these sculptures? I know you mentioned that they were inkjet prints. 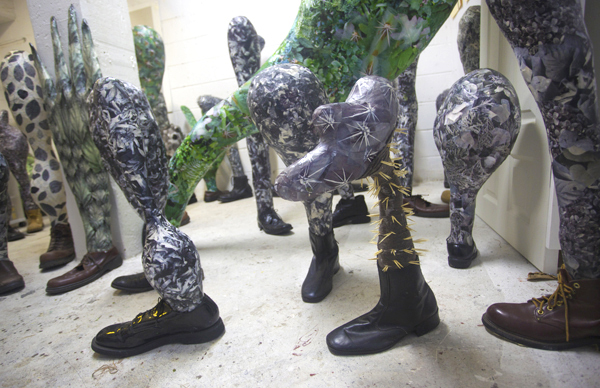 How did you come up with the shapes of the sculptures and where did the images from the inkjet prints come from? F: What is your past work like? MK: I’v been focus on consisten theme even though I express it through illustrations or fashion design. When I made a clothes in my undergraduate as an assignment of fashion class, what I made was a suit for the thief. That has a extra space as a part of the close and it bulges when the thief put the stolen stuﬀ in the space. I took a photo of the model in the clothes and cut it out and put another photo I took in my neighbor which is a common public space as collage works. What I made when I ﬁrst come to America was a small sculpture made by bread. They are combined breads and daily materials I found in a hard ware store. I put a lot of them on a table, so it looked like a dining table which was served uneatable break ﬁrst on. F: What do you look for in a studio? MK: A home is ﬁlled with 100% reality. But when I come out from the house and walking toward my studio, I ﬁnd something funny in everyday scenes and that makes me imagine some new idea for my works then I make out something new from the idea in my studio. Studio is a place I can forget about reality and play with an imagination freely, so it is a factory to make a strange dream to me. I need to keep it to be on a boundary between reality and dream. Of course I need a enough space to put my sculptures. F: Has the school studio environment and the closeness of your peers affected your work? MK: I got a lot of good stimulation in my studio environment at school. 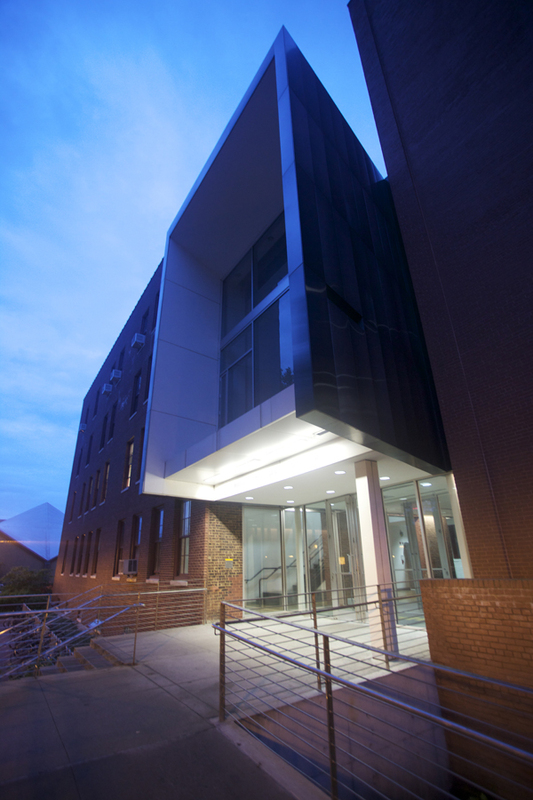 When I had just come to Pratt, I always struggled to use English, so art work was the only communication tool to me at that time. Conversation with my friends and professors in class through each works was so helpful for me to understand each other. I think this process was hard to have other environment. Thanks to my patient friends and teacher, I got a lot of great invisible tools to express my self.